In my quest for the ultimate home theater bass, I’d always felt that my single Velodyne HGS-15 subwoofer wasn’t delivering quite the low frequency experience I was expecting. Visits to local IMAX theater had me jealous. So I set out figure out what was missing. Much of what I learned is included in my other post entitled Ultimate Home Theater Subwoofer Designs, which describes Infinite Baffle and Folded Tapped Horn subwoofers. 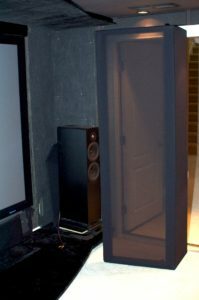 This post details how I installed an Infinite Baffle subwoofer system in my home theater. 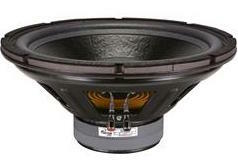 I chose an Infinite Baffle subwoofer design because it delivers extremely low frequencies with perfectly flat response. Those low, chair-shaking / chest thumping / hair-on-your-head vibrating frequencies are what I was missing, and Infinite Baffle subs are the solution. My home theater is in my basement, and the only option was to mount the subwoofers in the front right corner of the room in the 20-inch section of wall that overlaps with the mechanical room. I measured and remeasured, and it looked like I could just barely fit 18-inch subwoofers in the wall and still have about 1-inch of clearance between the rear of the speaker magnet and the water heater installation. Of the two, the Fi Audio is both the better performer and the better value. This is because one 18-inch Fi IB3 moves more air than 2 of the 15-inch Dayton Audio IB-385. Also, the Fi has a larger cone surface area, a longer cone excursion, and a more powerful magnet. This made it an easy decision: I went with Fi. In retrospect, I would probably have been fine with just 2 of the 18-inch Fi subs. After installation during equalization, I reduce the subwoofer gain by at least half to achieve a flat response in relation to the other speakers. But at least I have some sonic insurance that there will always be plenty of bass reserve if ever needed. How large does the adjacent room need to be? It’s helpful to know what the smallest space requirement is for an Infinite Baffle sub installation. To determine this, look up the VAS specification for the subwoofer, which is measured in Liters. The required rear enclosure volume for each subwoofer should be 10 times the VAS or larger, but there is very little perforce difference if the volume is only 4 times VAS. The VAS of the Fi Audio IB318 is approximately 12.5 cubic feet. So each IB318 needs only about 50 cubic feet minimum to achieve 4 time VAS and 125 cubic feet for more or more to achieve the ideal 10 times VAS. For my installation of four IB318s, the ideal volume is 500 cubic feet or more, and acceptable performance starts around 200 cubic feet. The total volume of my adjacent mechanical room approximately 2160 cubic feet, so it’s more than large enough. You can read this post and this post on the Home Theater Shack forum if you want more details. The mounting panel needs to be extremely rigid to withstand the force produced by 4 huge subs. The 3/4-inch thick plywood available at most home improvement stores isn’t strong enough – the mounting panel needs to be strengthened by laminating (gluing) two panels together. To increase the strength, two different types of wood are used. Individually, each panel was extremely wobbly. However, after laminating the panels together, the assembly becme rock solid. DIY subwoofers require that you provide your own amplification. The most cost effective option is a professional PA amplifier; they deliver huge amounts of power at a relatively low costs. There are downsides to these amps, such as louder fans, brighter lights, no IR remote input to turn them on or off, balanced XLR input connections (instead of conventional RCA connectors), and odd Speakon speaker cable connectors. All of these issues can be overcome, as detailed below. Behringer EP4000 Amplifier – I purchased 2 of these, with each one powering two subwoofers. These amps use a conventional Class A/B amplifier design that is powerful and dependable. It costs about $300 and produces about 3000 Watts RMS. Most importantly, it doesn’t have a low frequency filter, so it will produce output all the way down to the 5Hz and lower frequencies obtainable by Infinite Baffle Subwoofers. If your receiver doesn’t have balanced XLR outputs and only has unbalanced RCA outputs. Option 1: the Behringer EP4000 does have connections for unbalanced inputs on the back panel (in addition to the balanced input connectors.) The connectors are 1/4″ 2-conductor TS style, so you would need something like this 1/4-inch TS to RCA adapter or this dual 1/4-inch TS to RCA cable to connect your receiver to this amp. With these, you can connect the LFE channel of pretty much any receiver to this amp. Option 2: Convert your RCA unbalanced to a XLR Balanced signal using a level converter; most sPA amps only accept XLR inputs and they are more immune to interference. So you’ll need something like the MCM Custom Audio Model 555-8485 Line Level Converter or the discontinued Samson S-convert. Long XLR Male to XLR Female balanced patch cable to connect the receiver or converter to the amplifier. Switchcraft 35RAPC2AH3 3.5 mm mono jack mounted in the rear of the CyberPower Power Strip to accept the 12V remote turn-on signal from the 3.5 mm output of my receiver and pass it to the relay. Odyssey CRS08 8 Mini Equipment Rack to hold the amplifiers and the power strip. 10 Gauge Speaker cable to connect the amps to the subwoofers. I’d be remiss if I didn’t give a quick overview of speaker impedance and how the subs are wired to the amplifiers. Each amplifier is in a bridged mono configuration with a 4 ohm load. The subs are 2 ohms each, with 2 subs wired in series to produce a 4 ohm load. 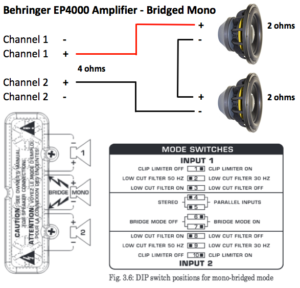 On the EP4000 Amp, this is accomplished by flipping two of the configurations switch to enable bridge mode, and connecting the subs as shown in the diagram below. My Anthem D2 receiver has some of the best sound equalization available. Unfortunately, it only works between 20 Hz and 20,000 Hz, meaning that it doesn’t offer equalization for the lowest frequencies produced by an Infinite Baffle subwoofer setup. Fortunately, the receiver does have an option to pass these low frequencies to the subs, and the subs sound pretty good below 20 Hz without equalization. A Windows PC to create the test tones at different frequencies, read the levels from the microphone, and adjust the MiniDSP 2×4 equalization curves. Thanks for reading and I hope you enjoyed my documentation of my do-it-yourself home theater subwoofer project. Hopefully you can take what I’ve learned and apply it in your own home theater project. If you have any questions, please post them in the comments section below. This is a very informative post! Thanks for sharing your wealth of knowledge. Excellent job getting this post completed while visiting this weekend! Sorry we couldn’t add more value to the very informative post. 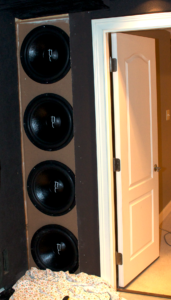 how many cubic ft is the room behind your subs? Also is there a way to connect the lfe channel from my marantz to these amps? Please let me know. New at the diy stuff. Thanks for your time. Mark, there are 2 sections to my mechanical room (the room that acts as the enclosure behind the subs.) The total volume is (12ft x 12ft x 10ft) + (12ft x 6ft x 10ft) = 2160 cubic feet. This pretty similar to the volume of my home theater room, which is approximately 2500 cubic feet. If you want to get extremely technical about it, look up the VAS specification for the subwoofer, which is measured in Liters. The required volume for each subwoofer should be 10 times the VAS or larger, but there is very little perforce difference if the volume is only 4 times VAS. The VAS of the Fi Audio IB318 is approximately 12.5 cubic feet. So each IB318 needs only about 50 cubic feet minimum; 125 cubic feet for more or more cubic feet to be ideal. For my installation of four IB318s, the ideal volume is 500 cubic feet or more, and acceptable performance starts around 200 cubic feet. This is a good question; I’ll update the article to include this. And to answer your other question, the Behringer EP4000 does have connections for unbalanced inputs on the back panel (in addition to the balanced input connectors.) The connectors are 1/4″ 2-conductor TS style, so you would need something like this 1/4-inch TS to RCA adapter or this dual 1/4-inch TS to RCA cable to connect your receiver to this amp. With these, you can connect the LFE channel of pretty much any receiver to this amp. I’m very interested in trying an IB set up in my new home theater room in conjunction with my pair of Klipsch KW-120-THX subs. One thing I’ve come to learn is that sub placement can very important based on seating position. You can move a sub 1 foot forward, backwards, left, right or flip it backwards into a corner and get dramatically different base volume from you seating position. With IB set ups your sub placement is extremely fixed and can not be moved or altered to avoid sitting in a completely dead spot in the room. Often you don’t have the option to change seating positions. My question is: Is there any way to minimize this chance with different mounting designs say facing the subs straight towards the viewers or doing a manifold where the subs are facing each other? My home theater room is in my basement underneath my outside deck. My whole basement is ICF and the back wall of the Theater room that joints into the rest of the basement is an ICF wall as well. The room is very well isolated from the rest of the house. My plan is to turn my front stage into the IB sealed enclosure. Its will be 2′ Deep x 9.5′ Tall x 16′ Wide and was going to run 2 of the FI IB318 in it. That enclosure will easily give me my 10x volume needed and since its not a closet or my attic I wont shake the rest of the house apart or make being anywhere else in the house unbearable while some else is watching a movie. I’m just wondering if I’m best off facing the subs straight out or more of in a dual manifold facing each other inside the enclosure with the opening facing the audience? Like I said earlier this isn’t an enclosure that you can shift around the room to find the best placement. Also one other questions. Past experience has always proven that the bigger the sub the sloppier the bass, the smaller the sub tighter the bass. IE 10″ or 12″ vs 18″. Is this still the case with these IB setups say using 4 – 15″ vs 2 – 18″? My 2 Klipsch THX subs sound incredibly tight and I don’t want to turn my Klipsch 9.2 THX Untra2 system into a sloppy mess. Especially after spending all the time to build this custom IB front stage. Hutch, you’re absolutely right about placement greatly affecting response in different parts of the room. This is going to happen regardless of the configuration. The best way to combat this is to spread the subs throughout the room as much as possible, and make sure they are not directly facing one another (creating standing wave reinforcements and cancellations, depending of frequency.) In my opinion, a manifold would tend to focus the sound more than disperse it, so I don’t think this would help. There’s always going to be a trade-off for larger speaker cones. Transient response will be slower with bigger cones, but low frequency capability increases. This is somewhat diminished by IB speakers, because the cones are a lot more free-moving compared to sealed enclosures. Having powerful amps and running the speakers well below their highest volume levels will also help. But it’s still a trade-off. I prefer IB for movies, but just the tower speakers and maybe my 15-inch sealed enclosure Velodyne for music. I have a question on the Behringer EP4000 Amplifier. As far as I can tell each IB318 is rated for 550W RMS. So, in series that would be 1100W RMS. If the Behringer EP4000 produces 3000W RMS that is almost 3x the rating. Did you have any concerns of overpowering the subs? I am considering the Behringer EP2000 which has a 1300W RMS bridged rating. Any reason you went with the EP4000 over the EP2000? Dan, this is a really good point. I went with the 4000 because there wasn’t a huge price difference at the time of purchase. Also, I don’t completely trust power ratings. They seem to be over-inflated and may not be accurate at very low frequencies. In my experience, clipping of the amp output is more likely to cause speaker damage than is over-driving the speaker with too much power. Both are concerns, but I prefer higher power on the amps driving at lower % of total output. Higher amp power also theoretically improves transient response of the speakers, but I can’t say to what extent this is a benefit. Via email FI Audio said they actually recommend 600-750W per Subwoofer. Which is different from what I’ve seen online elsewhere (550W). How about the Behringer inuke 3000 (or 3000dsp)? They are rated 3000W in to 4 Ohms. A couple places said they have a -3db roll off of 5Hz. And they are more efficient than the EP series. I read on another page that you had a couple of those burn out on you? I didn’t have much luck with the Class D amps. I was thinking along the same lines a you: smaller, cooler, more efficient. But not very reliable, and not sure why. My suspicion is that Class D amps derive efficiency from fast switching. But at 5 Hz, the duty cycle is much more demanding than it is at 12k Hz. At low frequencies, the switching spends much more time in the “on” state than the “off” state, leading to overheating. Just a theory. But I can say for certain that conventional amps have been more reliable for me. How did you mount the speakers to the wood? I assume wood screws, not bolts? What size and length? I tried T-nuts and had no luck. There wasn’t enough of a lip a the back of the mounting panel to accommodate them. I had much better success using button-head machine screws inserted from the front), fastened using washers and nylon-insert nuts on the back. The only reason to use T-nuts is if you can’t access the back of the sub, as with a sealed enclosure. With an infinite baffle setup, access to the back of the sub typically isn’t an issue. So how did the IB sub turn out? Does it “work”? I have had the opposite results with class D amps. 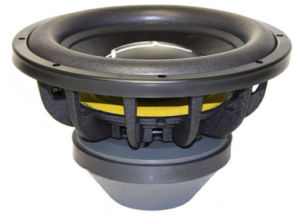 For low frequencies, they have been the most reliable and clean sounding. Although the cleanest amp I have ever used for subs in HT was the Adcom 5500. The behringer and other class D amps did not sound as clean (tight bass). My reference movie is the cannonballs firing in the movie Master and Commander. If you don’t have access to one, you don’t know what you’re missing, but they only produce 800 watts total per amp. I had to buy four for each of my 15″ subs at the time. I have a Lab Gruppen knockoff now with 14000 watts playing qty 16 18″ subs. 3hz shakes the whole house! Class D can play low, where the adcom wouldn’t do much of anything. I also felt the LG played cleaner than the Behringers. I’ve heard great things about the Lab Gruppen amps. I’ve seen the knock-off versions from China, but ultimately was put-off by the buying process and the intellectual property issues. But definitely a high performance option. Not that I need more amplification; my amps are turned down well below their max power levels already! Glad I came across this, have been considering as a DIY project for a while. Need to do a lot more research here, but wondered if there was a limit to how large the space behind the subwoofers could be, and whether it needed to be sealed or not. I have a very large crawl space behind my theater, also vented to the outside. Brian, you have the ultimate setup for Infinite Baffle. Hi Carlton. I have been looking to use an enclosed rack mount cabinet as an enclosure for a subwoofer and learned the IB sub might be the driver to use. The audio is used in an open floor plan finished basement with the fronts centers and surrounds in the front quarter of the space. 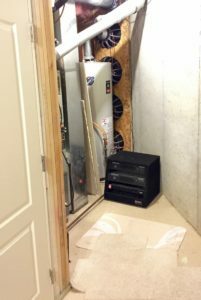 enclosed rack is in a corner cabinet that is approximately 7.5 feet tall and 24″ on each side set in the corner and a flat face to accommodate the 19″ rack. I have 24U’s above and an place below that was supposed to be a door or access panel. I thought this might be a good place for the sub as I do not have many other spaces and do not want free standing speakers. Only problem is that the rack is in the adjacent corner to the back of the room with the screen and surround system. I am worried that the location of the sub being low (1 foot off the ground) and to the right rear of the listening/viewing area. We are talking about 12″ – 15″ behind. Do you think this enclosure or location will present any problems? Also, do you have recommendations for a 15″ or 18″ driver for this scenario?